From birdie breads to soak and simmer, great lines of cooking foods from Momma's Birdie Bread , Crazy Corn, Harrisons, and Higgins. Your companion birds want and deserve more in their daily diet than just seeds/grains/pellets and fruits and veggies -- spice up their lives a bit with these great cooking foods. From birdie bread mixes from Harrisons and Momma to exotic concoctions from Higgins, your birds will enjoy a warm complete meal. What bird would resist a slice of Millet and Flax Bread? or perhaps an exotic bowl of basmati rice, couscous, or other great ingredients spiced up from the exotic corners of the globe? 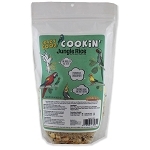 Higgins Worldly Cuisines are the natural, healthy foods that add variety to a companion bird’s daily diet.